Howard P. Milstein, Chairman of New York Blood Center’s Board of Trustees; Fire Commissioner Salvatore J. Cassano; and Christopher D. Hillyer, M.D., President and CEO of New York Blood Center (NYBC) joined today to add the names of 14 bone marrow donors to the Honor Roll of Life at the 10th annual induction ceremony at FDNY Headquarters. During the ceremony, Firefighter Christopher Howard, 31, of Engine 255 in Brooklyn met the recipient of his lifesaving bone marrow, John Ciempa, 66, from Lakeland, Florida. And another FDNY Firefighter — Billy Zask Jr., of Squad 288 in Queens — was reunited with the recipient of his bone marrow donations – Alex Maldonado, 9, of Puerto Rico. Alex was just 2 years old when he received his bone marrow transplant. Honored for donating bone marrow in 2013 were Capt. Charles Buser, Lt. James McCarren, Lt. Joseph McGovern, Lt. Francis Cummins, Firefighter Michael Carroll, Firefighter Joseph Sanger, Firefighter Anthony Gazzara, Firefighter Fredrick Perdue, Firefighter John Schroeder, Firefighter Vincent Mirando, Firefighter Keith Jackson, Firefighter Thomas Gonzalez, Firefighter Marlon Byrne, and EMT Nicholas Morisano. Howard Milstein, Fire Commissioner Salvatore Cassano, and New York Blood Center recognize the 2013 members of the Honor Roll of Life. Howard Milstein and Commissioner Salvatore Cassano. 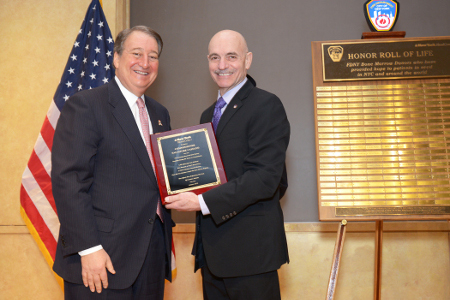 Commissioner Cassano is holding a plaque recognizing his role in promoting donations of blood and bone marrow during his time as FDNY commissioner.